We are an organization promoting traditional music, dance, and storytelling in Northeastern Pennsylvania. 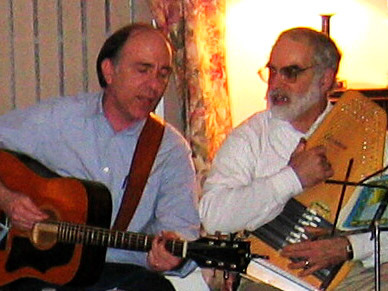 Monthly "singing circles" have been on-going since 1982, and often start with a pot-luck dinner. They are informal gatherings, usually held the first Friday of each month at a member's home. We begin with a few sing-alongs, then we take turns around the circle, offering something we have prepared, requesting a song or story, or just come to listen and enjoy homemade entertainment. We use a "democratic" format (taking turns), which encourages people of all levels of accomplishment to participate. All Folklore Society events are smoke-free, and only non-alcoholic beverages are served. Write us to get on the mail list for the monthly open sing. The Folklore Society sponsors a New England Contra Dance, usually on the first Saturday of each month, October to May. Check out our dance page, print yourself a copy of our current flyer, or contact us by Email or telephone (see below).